Sarah G and a Blog Auction!!! Once, while on a writing retreat, I decided to canoe out to a little island in the middle of a lake and spend an afternoon writing there. No sooner had I settled in, though, then the wind shifted. When I stood up and looked behind me, I saw a big storm blowing in from exactly the direction I would need to go to get to shelter. I immediately untied the canoe and began paddling against the wind, but despite all my effort, I could not make it to shore fast enough. When the storm broke, I was still out on the water paddling as hard as I could. “This is nuts,” I finally thought to myself, “Wet is wet. No amount of paddling is going to change this situation now.” And so, rather than continue fighting against the rain, I picked my paddle up, laid it across my lap, closed my eyes, and allowed myself just to be in the storm. Listening to the rain hit the surface of the lake, I was struck by how little it sounded like water—how much, in fact, it sounded like a dry rattle of stones out in the dessert. And that made me think how at the moment, wet to the bone, adrift in a canoe, I was actually sitting in an incredible position of privilege. Not only did I have the leisure to be out on a lake in the middle of an afternoon, the biggest concern I could have with water was getting caught in the rain. I never wanted for enough water to drink or had to worry about whether or not that water was clean. I might be swept to a distant shore by the wind, but my hometown was in no danger of being swept off the map by drought. When I finally did make it back to shelter, I sat down and wrote “Though the Rain has Relinquished Speech,” thinking about how fundamental water is, and how to be human is to be tied to the rain. 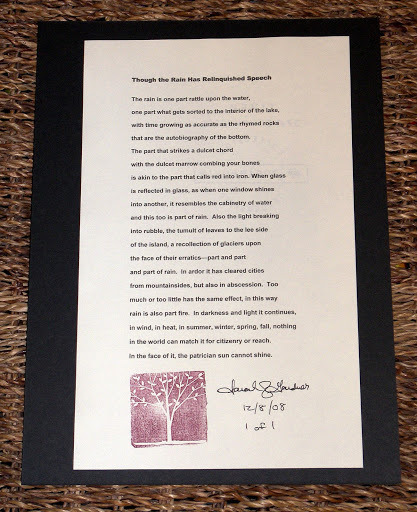 Sarah has generously donated a signed, single edition print of “Though the Rain has Relinquished Speech” to be auctioned off in an attempt to raise money and build wells. This poem will be included in her second collection, The Calculus of Owls, which will be published in August of 2009. You’ve heard a preview of Sarah’s work, now bid on on a copy of this precious poem!! The bidding will begin NOW over at www.dancingforwater.blogspot.com. It will end Thursday (12/11) evening at 7pmCST. Please leave your bid under the link below the “Sarah G” post labeled “Comments.” Check back throughout the two-day period to participate in this “blog auction.” The bidding will begin at $20. (Remember how we told you that $20 gives one African water for 20 years. Truly, your bid matters!!) If you are unable to check this blog throughout the period of the auction, feel free to send your highest bid to dancingforwater@gmail.com and we will bid on your behalf. ALL PROCEEDS GO DIRECTLY TO charity: water. The winner (the highest bidder as of 7pm on Thursday, December 11th), will be asked to send an email to dancingforwater@gmail.com identifying themselves. We will then provide them an address to send their check (made out to charity: global so that it’s tax deductible). The winner should also provide the address to which we will ship the print free of charge.